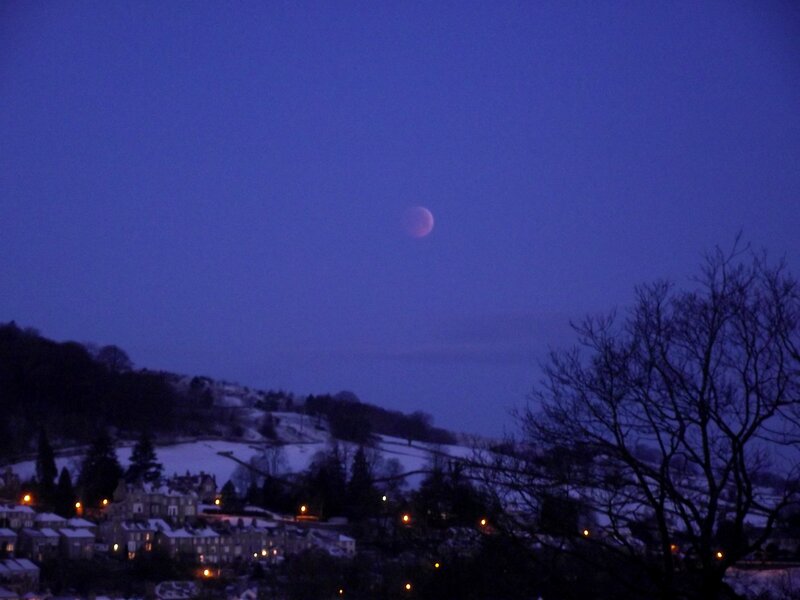 For the first time in almost four centuries a total lunar eclipse coincided with the solstice – mid-winter for northern hemisphere skywatchers and mid-summer for the southern hemisphere. For those with a clear view of the sky (I was not that lucky! ), the entire event was visible from North America, Greenland and Iceland, while western Europe saw the beginning stages before moonset and western Asia got the later stages after moonrise. Australia also saw the late stages of the eclipse. People with clear skies in the northern hemisphere saw the Moon transformed into a “coppery orb,” as Tony Hoffman from Queens, New York called it (see his image below.) The Moon didn’t disappear completely, as the residual light from its surface is refracted by our atmosphere, resulting in the Moon turning a coppery, red or brown color. The eclipse lasted for about three and a half hours. See some images and videos from around the world, below. Clicking on each image will bring you to the original source. 'Even with high cloud, a 7 second exposure brought out the beauty of the eclipsed Moon,' said Mark Zaugg from Calgary, Alberta, Canada. The ruddy totally eclipsed Moon as seen by Nick Bramhill in Aberdeen, UK. You can see the more pictures and the write-up Stu did about the eclipse on his website, Cumbrian Sky: Eclipse-Watching from Narnia. 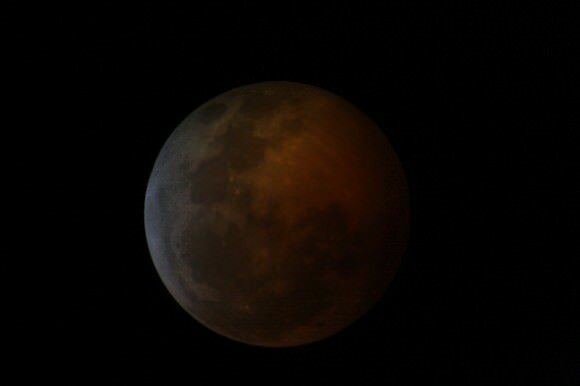 Astronomer Amanda Bauer took several images of the eclipsed Moon rising over Sydney, Australia, as seen below. See her website, Astropixie, for more images she took of the event. Astronomer Amanda Bauer took this image of the eclipsed Moon from the Harbour Bridge in Sydney, Australia. Efrain Morales from the Jaicoa Observatory in Puerto Rico took this sequence of images. 'The weather was not under under optimum conditions,' he wrote, 'but managed to take this sequence thru the cloud gaps until it finally covered it up. 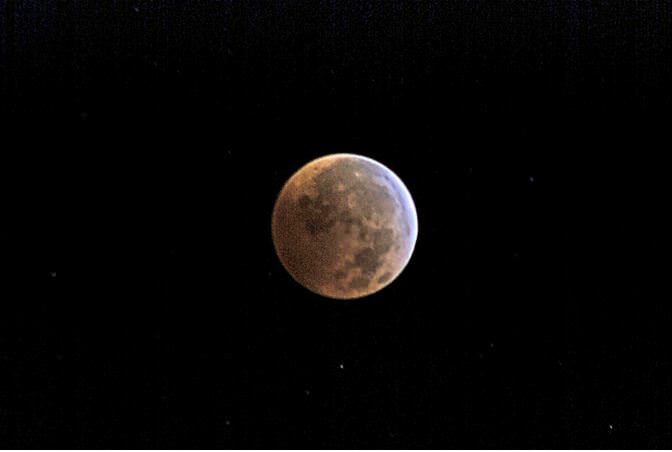 This view of the red Moon was taken by Pete Riesett in Baltmore, Maryland. This image was taken by Jen Scheer (aka @flyingjenny on Twitter) from Merritt Island in Florida. Former space shuttle technician Jen Scheer (@flyingjenny on Twitter) got up earlier than usual (she takes a daily sunrise picture from around Kennedy Space Center each morning) to capture some great shots of the eclipse. You can see more of her images at her Flickr page. This was taken by Phil Plait, the Bad Astronomer, in Boulder Colorado. 'Deep into totality,' Phil said. You can also see a great collection of images on JPL’s I’m There Flickr Group, this collection at a German astronomy website called ASTROTREFF, this amazing set of images from Slovakia, Carolyn Collins Petersen has a bunch of images she took from near Boulder Colorado, and this NASA Flickr page. 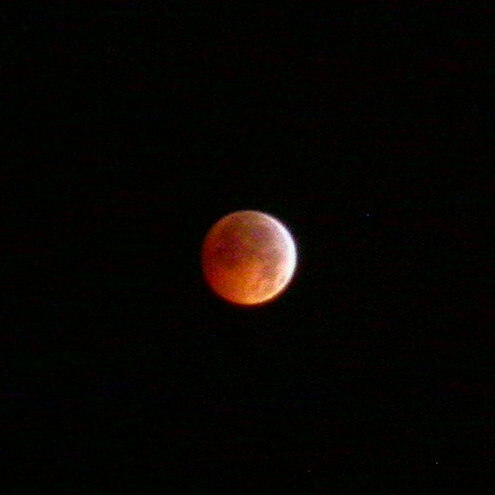 Lunar eclipse from Fair Lawn. NJ. 'Wish I had a more powerful lens but it was well worth waiting up for,' said Universe Today reader Mary Durante Youtt. Here's one from Lancaster County, Pennsylvania. 'We had to dodge clouds, cold, and wind that jiggled the tripod,' said Beth Katz. 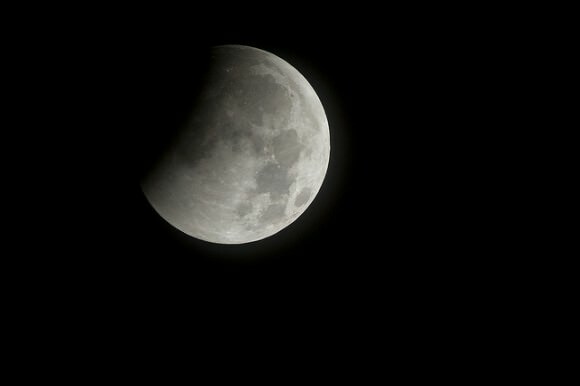 The eclipse as seen by photographer John O'Connor near Kennedy Space Center. This image was taken by photographer John O’Connor, who normally takes images of rockets and spacecraft (see his website NASATech, for amazing virtual tours of spacecraft, launchpads and more). He was up in the middle of the night to take images of space shuttle Discovery’s intended rollback from the launchpad to the Vehicle Assembly Building, but the rollback was delayed because of a technical problem.